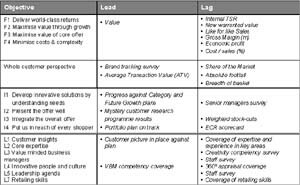 Home » Modern Balanced Scorecards » Balanced Scorecard Various Types » Simplistic Balanced Scorecards: Please don’t do it this way…. Simplistic Balanced Scorecards: Please don’t do it this way…. His reply: “Don’t worry about what we put in the book. That was 18 month old consulting when we wrote it”. Bear Bob Kaplan’s answer in mind when you consider that this diagram came from page nine of their first book. You can try, but you’ll miss great opportunities to deliver results, it is unlikely to create change and it probably won’t last more than a year or so. Amazingly, we still see people recommending this approach and others trying and using it. It has moved on extensively since then. But this is a very old view dating back to the early use. 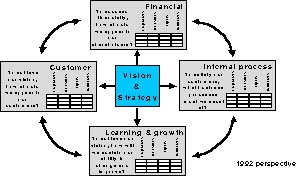 The whole Balanced Scorecard approach has moved on considerably since then. By 1994/5, in Renaissance, the company set up by Norton & Kaplan, it was clear that this approach did not work well. Measures were merely surrogates for what was really intended, the objective. Also, there was often no relationship between the measures in the perspectives, even though it was implied. That is why strategy mapping evolved, using objectives rather than measures, to communicate what needs to be achieved, with the objectives being measured. In publishing their third book on the subject it is clear they are still trying to get that message across to many. Of course if you want to find out some of what was not in the books, talk to us or see below. Want to learn how to implement it properly? Having worked with the originators of the Balanced Scorecard, Norton & Kaplan, we have a unique, and extensive, experience. How to use the approach to execute strategy successfully and therefore improve the performance of your organisation, measurably. Clients are still using our approach over 5 years after we worked with them. This clearly demonstrates the effectiveness and persistency of our consultancy methods.